Its time for another Secret Recipe Club reveal! I really love belonging to the Secret Recipe Club and am so happy that Amanda, the founder of this club and author of Amanda’s Cookin’ came up with this fun idea! Amanda deserves a lot of recognition and thanks for the hard work she has put into this club! I love being assigned a blog to go through and find something that appeals to me to make. Sometimes I’m lucky and I find something I’ve thought about making but never had gotten to it before and SRC gives me the little shove that I need to actually do it! If you enjoy following along with us, make sure you visit and like our Secret Recipe Club Facebook page also! This month I was assigned the blog Quick and Easy Cheap and Healthy written by Anne. I’ve been looking Anne’s blog over quite thoroughly since I was given my assignment and had been struggling about what I was going to make. Not because there wasn’t anything there I didn’t want to make, but because she has several great recipes on her blog! I finally decided to scour the bread label and that’s when I came across her recipe for English Muffins. 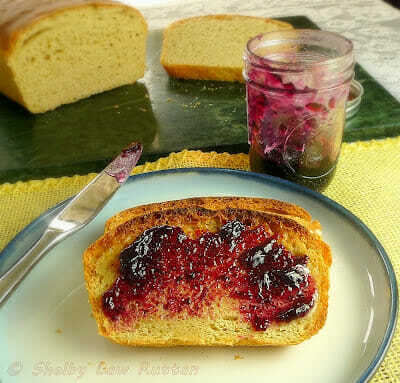 At first I thought I would absolutely go with the muffins themselves because I have wanted to try making my own English Muffins, but then after I had the dough rising I ended up changing my mind and went with a loaf of bread instead. One of the things that I absolutely love about going home to visit my family – besides seeing those I love of course – is having breakfast in the morning with my Mom and Dad. My mom rarely ever has bread that is not homemade. I can always count on there being at least more than one flavor of bread to enjoy. This last time it was Raisin Bread and a Cinnamon Swirl Bread. I am a huge fan of homemade bread toasted in the morning. Spread it with some butter and a little of my parent’s homemade grape jam or homemade apple butter (which by the way – they grow their own grapes and apples too!) it is absolutely the best thing to eat in the morning. For this recipe I basically followed Anne’s recipe and just changed a couple of things. I used all white whole wheat flour, agave nectar instead of honey, shaped it into a loaf, and didn’t use any cornmeal. I also don’t have a bread machine anymore so I will make sure to leave instructions on how I mixed my bread together. For Anne’s recipe and method on how to make the muffins, make sure to visit her site. When you go to her post, make sure you read the whole thing! The post on “fork split muffins” really gave me a chuckle! While your there, make sure to explore even more. Anne has a lot of information on her site that is really useful and interesting! Definitely a blog to keep reading. Thanks Anne! Anne also has a Facebook Page, you can follow her there too! In small saucepan over low heat, warm almond milk and butter until butter just starts to melt. Remove from heat and stir to melt remaining butter. If your milk gets too hot, let it cool to lukewarm. Hot milk will kill your yeast. Whisk egg and agave nectar together with lukewarm milk and butter. In large mixing bowl mix flour, yeast and salt. Make a well in center of flour mixture and pour egg/milk mixture in center. Stir until a dough forms. Turn dough out onto a floured surface and knead until smooth. You will need to use a little extra flour while kneading to prevent sticking. Place dough in a glass bowl coated with cooking spray. Cover with plastic wrap and sit in a warm, draft free place to rise. Let rise until dough has doubled in size. Punch down and remove dough from bowl and knead a few times to deflate. Shape into a loaf and place in loaf pan coated with cooking spray. Let rise until bread has almost doubled (or reached the top of the loaf pan). Bake at 350 for approximately 25-30 minutes, until loaf has browned and sounds hollow when tapped lightly. Place loaf on wire rack to cool. I love to slice my bread very thin and toast it – to make it nice and crispy! Grumpy however, likes his sliced thicker (he’s not much of a crunch guy!). Either way, slice the way you like and serve with your favorite toppings! Enjoy! To see what other members of the Secret Recipe Club found and created this month, check out the links below! I wish I had some warm bread in front of me right now. That looks great! It's hard to beat homemade bread. Looks amazing! I like that you turned the muffins into a loaf, and that you used white whole wheat flour. It looks perfect! I'm a big fan of buttered bread in the morning. Fresh is the best! Thanks Veronica 🙂 I'm with you, nothing better than buttered toast (with real butter!). I love that you turned this into bread! Great idea. And I've stopped using my bread machine since making that recipe, so now when I make it, I use my Kitchenaid instead. I will have to try the bread idea next time. Anne, I do miss the convenience of my bread machine for the mixing and rising part of my breads but not so much that I'll spend the money to run out and get one. 🙂 I do have a Kitchenaid too but its so huge and I have to store it away that I don't want to have to dig it out every time I want to use it. lol. Does this clasify as lazy? Oh yum!!! This looks completely easy to make. Great choice! This looks really, really good…I could totally go for a slice right now. The bread looks fabulous, especially spread with jam. 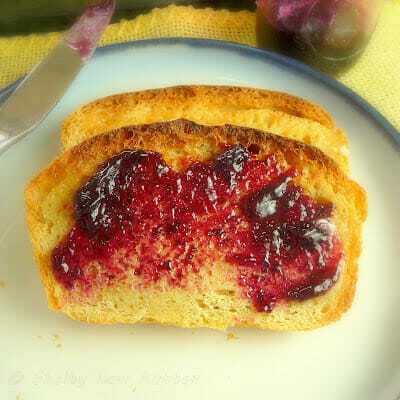 I've been wanting to make English Muffin Bread. One look at the ingredient list and I pinned this. I love that it has almond milk and uses white whole wheat flour. Can't wait to try it! I can just imagine the smell of this toasting no less the fabulous taste great job! Looks fantastic…and I do love a piece of toast for breakfast. Great post. Mmm, you really sold me on the picture of the toasted bread with just butter. I love English muffins toasted! Great pick from Anne's blog! the butter alone is great, but me, I'm a naughty girl and have been putting peanut butter and jam with the butter. lol I'm so bad! I have been meaning to try making English muffin bread for the longest time. This looks good! Aw, well, I actually call my parents almost every morning…I miss mine too! I have been dying to try English Muffin bread since I was 15 and saw it in a Pillsbury cookbook. I think your post is a sign that it's time. It looks terrific..great choice! Lisa, it really was not hard at all – and I didn't even have the convenience of a bread machine. 🙂 Try it, you'll be happy! 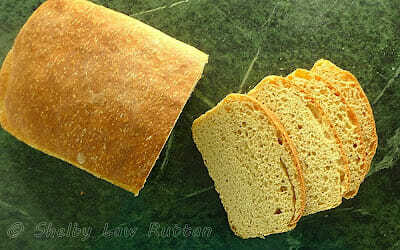 Love this healthier bread! It is going on my todo list. This is a bread, I could sink my teeth into. That jelly certainly perfects it. Fresh bread in the morning is the best. This English Muffin Bread sounds really cool and yummy, never heard of it in bread form. Great job. And I was so happy to have picked you and even more thrilled at your comment on my post. oh man, this looks incredible! i bet it smells amazing, a perfect way to start the day! Loooove English Muffin Bread. I made some just last week. Wonderful choice, and it toasts so fantastically too! English muffins are one of those things on my list of foods to make at home. Maybe making them in to a loaf first will get me moving in the right direction. This looks (and sounds) great! 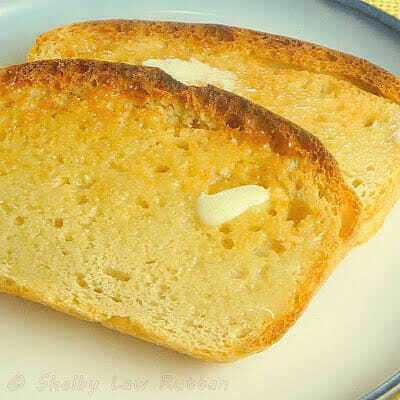 Love the idea of English Muffin Bread and now dreaming about a warm slice slathered with butter. I used to buy English muffin bread at the store all the time! Thanks for sharing. This sounds so easy and tasty. I'll have to try it out soon! YUM!! I am "pinning" this and going to try it soon…and it reminded me that I don't think I went through this weeks SRC posts….shame on me…look what I missed out. Oooh what a great SRC pick!! This bread looks so good – what a fab idea. I want to know if you use honey in the english muffin bread instead of the agave how much do you use?